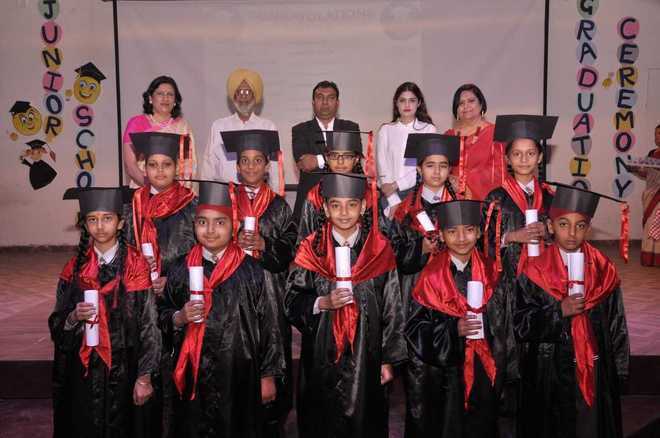 It was a proud moment for parents when Class V students of St Soldier School, Mohali, proudly donned their graduation gowns and hats. Parents and teachers cheered the students as they walked on stage and were honoured with certificates by chief guest Rajesh Chaudhary, PhD (Ayurveda). Principal Anjli Sharma congratulated the graduates and wished them good luck for future. The Millennium School, Mohali, organised a workshop “Karo Sambhav” in association with Juana Technologies Pvt Ltd., New Delhi. The theme of the workshop was “Electronic Waste Management” and its objective was to spread awareness regarding e-waste and its disposal. Teachers and students of different schools took part in the workshop. Saupin’s School, Panchkula, organised intra-house algebra competition for students of Classes VI to IX. The students participated actively in the competition and were happy to learn valuable tips to improve their skills.